We made it! Finally, the main set of results from our survey (opposite) have been published. Below is the press release the Wellcome Trust Sanger Institute put out about the work. Thank you so much to those of you who took the time to complete the survey and tell us what you feel researchers should be returning to research participants – we listened, you have a voice and here’s the outcome…. A survey of nearly 7000 people has revealed that 98 per cent want to be informed if researchers using their genetic data stumble upon indicators of a serious preventable or treatable disease. The study starts an important and on-going conversation about how our genomic data is used. The results show that genomic data has a perceived value to participants even if it is not currently clear what the information means for health outcomes. However, in general, the majority of people were interested in clinically actionable data and genetic professionals surveyed were concerned about returning data that cannot yet be interpreted accurately. The usefulness of findings was an important consideration for the majority of respondents, who were drawn from 75 countries around the world. The majority of participants wanted to receive information about serious conditions, even if the risk of developing the condition was as low as 1 per cent. However, fewer people were interested in receiving results for less serious conditions. Of the interest groups surveyed, genetic health professionals were five times more likely than other groups to think that incidental findings, results that are not the main focus of a research project but may be of clinical importance, should not be shared. Both genetic health professionals and genomic researchers were more likely to think that information about ancestry should not be shared. The survey was conducted as part of the Deciphering Developmental Disorders (DDD) project, which seeks to find genetic diagnoses for rare developmental disorders using patients’ sequence data. The DDD project did not search this data for disease indicators and only returned results likely to be linked to the patients’ disorders. 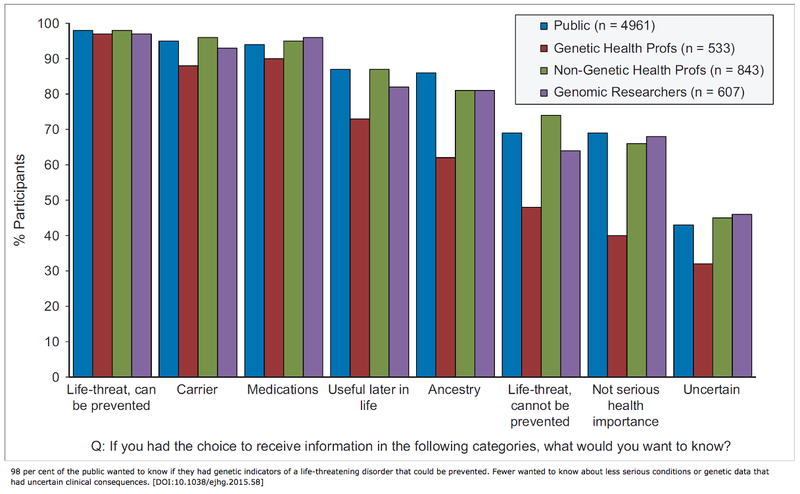 This fits well with the findings of the survey as, while participants were keen to learn about their genetics, the majority did not think researchers should be required to actively search for key indicators of disease in genomic data if it would reduce the time and resources spent on medical research.